Mission has a long-held reputation for producing keenly priced entry-level speakers and its brand new MX series pitches in to this hotly contested area. The six-strong range includes three standmount and three floorstanding models, of which the MX5 is the largest and costliest. And 'large' is a word that will certainly cross the mind of anyone unboxing a pair of MX5s. Standing a few centimetres over a metre tall (when fitted with spikes), this is one of the largest sub-£1,000 speakers we have seen in quite a while. So much so, that we would encourage any buyer to see a pair in the flesh before taking them home. The MX5 uses three six-inch drivers paired with a one-inch tweeter. These drivers are fitted with covers that incorporate built-in wave guides, something which Mission claims allows the speaker to perform at its best with the covers on. We tested them in this manner, although this was partly due to the fact that the covers looked as if they needed considerable force to remove. The fit and finish is of a commendable standard for the price. Detailing – like the large spiked plinth fitted to the base of each speaker and the terminal blocks – all feels sturdy and well thought out. The black ash finish is good with no visible seams or joins and the overall impression is of a well-constructed product. There is certainly a sense that you're getting a lot of speaker for the money. The large, black, multiple driver design, for example, does have a faintly aggressive air to it, suggesting that it will be at its best when most ballistic. In practice, the MX5 is far more refined than the menacing exterior might suggest. Thanks to a claimed sensitivity of 90dB, the MX5 should not prove a problem to most amps it is likely to be paired with. Given an output of 60 watts or more, the MX5 will generate more than adequate listening levels for most rooms, immaterial of size. The construction of the MX5 suggests a prodigious low end and, in practice, the MX5 has commendable bass weight. What is more of a surprise is the speed and agility of the low end and how well it integrates with the upper and midrange frequencies. The MX5 will follow fast and complex bass lines with accuracy and vigour, at the same time avoiding the sense of more subtle information being overwhelmed by it. Tonality is generally good: voices and instruments sound commendably real and believable. Thanks, in part, to the strong bass response, there is also an appreciable scale and soundstage to most recordings. Placed more than two metres apart, the MX5 will present a coherent space with artists and instruments believably placed within it. Absolute detail retrieval is good rather than great; there is a sense that the MX5 is giving the bigger picture, rather than presenting every last facet of the performance. Incidental details, such as audience response in live recordings or the aside of one musician to another, can be lost (when more exacting speakers will find them), but the overall sense of the recording is well captured. This does help make the MX5 forgiving of poor recordings, however it will make even very dire productions sound relatively together and enjoyable. This seems to play well across many musical styles and the MX5 rarely fails to be an enjoyable listen with virtually all genres of music. The sheer size of the MX5 is, perhaps, the biggest restriction to an unconditional recommendation. It may simply be too large to work correctly in smaller rooms, where two-channel equipment can often find itself. But, if you can accommodate a speaker of this size, the MX5 has much to recommend it. 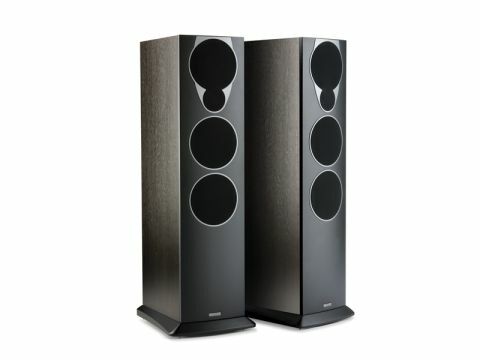 This is a well thought out and cohesive-sounding loudspeaker, with impressive scale and dynamics. It also presents a sufficiently easy load that should make it compatible with the majority of amplifiers. In the final analysis, the MX5 is a very likeable speaker and puts Mission firmly back in the sub-£1,000 speaker challenge.